Sustainability is the major and crucial issue facing the essential oil world. Huge quantities of plant material are needed to produce minute amounts of essential oil. Depending on the plant, the amount of raw material required to produce one liter (about ¼ gallon) of essential oil can range from a couple of hundred kilos (about 400 pounds) to several tons. The production of both popular and rare essential oils has resulted in several source plant species becoming endangered. Among the rare essential oils, for example, spikenard and rosewood have become so popular that the plants have become severely threatened with extinction. Sandalwood has been a popular essential oil for a long time and sandalwood trees have been threatened for a long time. For example, it was the source of the wealth of the Hawaiian royal family and other colonized people gained material wealth yet sacrificed the health of these sacred trees in many places around the world. Since authentic Indian attars are made with sandalwood essential oil, we have given the sustainability of attar-making and sandalwood a lot of thought. Santalum album, Indian Sandalwood, has been woven into Indian culture and heritage for millenia. Sandalwood essential oil has been very important for aromatherapy, cosmetics and perfumery for centuries, making Sandalwood one of the most valuable trees in the world. The most sought-after aroma comes from the heartwood of the tree. It takes decades for the trunks of the trees to be mature enough for good quality oil. In our lifetimes we will never see the likes of some of the majestic ancient sandalwood trees that were cut down before modern preservation efforts were introduced. There are several species of sandalwood and they grow naturally in many areas across the Pacific, from Indonesia to Chile and from Hawaii to New Zealand. Santalum album grows widely in India, most particularly in the south. It has been prized for centuries and is used ceremonially among Hindus, Buddhists and Muslims, for incense and in other ways. To make an attar, sandalwood essential oil is placed in the receiving vessel of the still. The steam carrying the fragile floral aromas, such as rose and jasmine, and even non-plant aromas such as the clay that makes mitti, are percolated through the sandalwood. Because of its unique properties, sandalwood has the capacity to capture and stabilize these fragile aromas, while at the same time ‘stepping into the background’ aromatically. In a good attar, you can barely smell the sandalwood aroma. The sandalwood oil becomes like a precious bowl or a cupped pair of hands that holds and protects the fragile floral aroma. 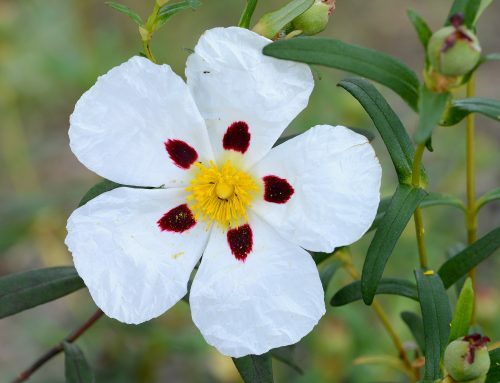 What gives sandalwood essential oil this unique ability? No one knows for certain. Florian wonders if the oil’s capacity to absorb and hold might be a reflection of an attribute of the sandalwood tree. Sandalwood trees are actually hemi-parasites of other trees that they grow near. It is said that by the time a sandalwood tree reaches maturity, it has consumed five other trees. While the idea of being a hemi-parasite might be judged negatively by some humans, perhaps the oils ability to absorb and hold is its hidden gift—its Shadow gift. Continual over-harvesting over hundreds of years, without any attention to replanting and replenishing the trees and protecting their habitat, has led to significant losses of natural populations, which has led to a global shortage of the oil and further increased its already very high price. Smuggling sandalwood on the black market has been another reason for its vulnerable situation today. Other things that have impacted the natural populations are spike disease, forest fires and lack of seed-bearing trees reaching maturity. In response to this situation, the Indian government put into place a monopoly. This meant only the Indian forest department had the right to harvest and sell sandalwood. Farmers and private landowners were encouraged to grow sandalwood on their land but had to sell the harvest to the Indian forest service. The monopoly by the forest services has now finally been ended, which has led to a renewed interest in both public and private sectors to establish sandalwood plantations in southern India. In response to the increasing prices and limited supply of sandalwood from India, companies in Australia are growing huge plantations of Indian sandalwood, Santalum album, and fast becoming the principal global suppliers. Note that there is a native Australian species of sandalwood, but it is not nearly prized as much. Efforts to increase the number of sandalwood trees and try to fulfill the global demand can be viewed positively, but there are limitations. Australian-grown sandalwood oil might be acceptable for cosmetics or perfumery applications, where all that is sought is a certain aroma or a high enough percentage of the desired constituents and there is no attention to the aliveness and energetics (what the alchemists called the viriditas or greenness) of the oil. However, in our work, AromaGnosis, we require the oils to have aliveness and viriditas so that they can be our allies and teachers. These qualities of the oils are based on the terroir of the source trees. Terroir, a term that comes from winemaking, is the way that the climate, exposure, soil, altitude and other factors that are unique to the particular place where a plant grows influence the secondary metabolites that a plant produces. Secondary metabolites are all the different molecules that a plant produces and which make it unique. This term includes all aromatic molecules, e.g. terpenes, ketones, etc. The secondary metabolites are what determines the unique odor of each aromatic species. Due to terroir, plants of the same species (and even chemotype) can have different amounts of the different aromatic molecules and different aromas. India has a very specific and unique terroir that produce the very best sandalwood aroma. Only sandalwood grown in India carries in its aroma the unique aliveness and spirit of India. This is probably one reason why sandalwood has been revered in India for so long, because there the sandalwood tree was best able to express its spirit. The deep relationship between the land and the tree has formed over millenia in India. While Australian companies try to promote their sandalwood as being the most sustainable on the market, it will never have the same aromatic signature as Indian-grown sandalwood, because of terroir. Nevertheless, this is not an excuse to promote or support unsustainable sandalwood and we do not intend to do this. It would be easy to use Australian suppliers of sandalwood, which you can easily find on Google and who claim amazingly sustainable production. 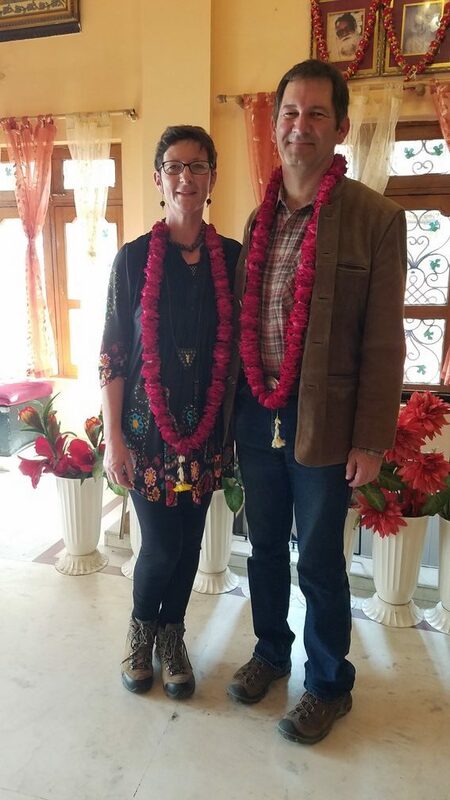 However, since Cathy has Indian roots and we are both passionate about sacred and ancient oils and attars and their viriditas, we feel we have no choice but to use, sustainably and with respect, the sandalwood oil that has been in deep relationship with the land and people of India for millenia. 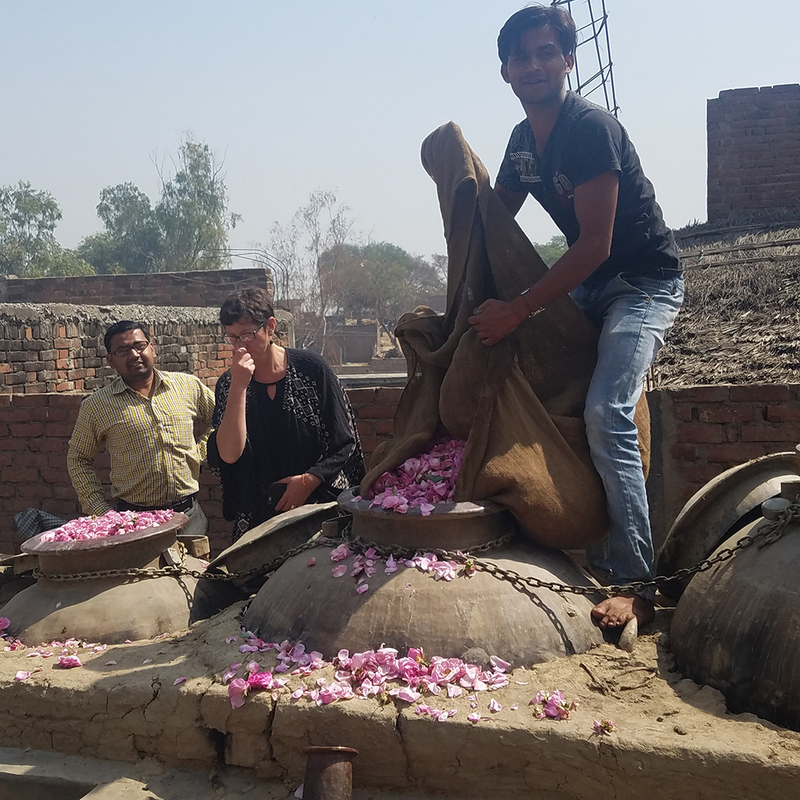 On a recent trip to India, we were lucky enough to visit Kannauj, the center of attar making in India. We have begun to forge a working relationship with Moosa Khan, our supplier of pure and authentic attars and are committed to sustainability and transparency. For centuries, Kannauj was a thriving hive of aromatic activity until the sandalwood situation became a crisis. Today many distillers have closed their doors for good. Others have replaced sandalwood oil in attars with paraffin and petroleum-based products. Moosa’s attars have provided an anchor and healing resonance for Cathy’s own inner journey and personal relationship with India. We both feel a strong desire to support the last remaining, fragile threads that remains of this ancient, alchemical and traditional plant extraction method before it is lost completely. We need to work together with people like Moosa. Many ‘westerners’, i.e. people who are wrapped up in the modern, capitalistic, ‘rootless cosmopolitan’ mindset that has taken over the US and Europe (and is spreading to the rest of the world), struggle to understand, feel understood, feel safe and trust when working with a culture very different from their own, such as India. Conversely, imagine how hard it must be for Indian distillers to maintain their traditional values when their clientele is all over the world, transparency is far from the norm, deceit and mistrust are widespread and traditional methods are sacrificed by many for profit and competitiveness. Our approach is to build a strong relationship with Moosa, based on trust and respect. We visit him, we share our work and approach with him, so that he knows how we use his precious oils. Above all, we want our customers to get a sense of him through our writings and visits. We hope to organize aromatic trips to India for those who are interested in the future. Transparency, trust and communication are extremely important. We need to enforce the needs of the market in terms of sustainability and quality through continued dialogue with Moosa and our other suppliers. Although this is challenging, it is meaningful and important in many different ways. Having talked about the challenges of sustainable production, we need to look at the other side of the issue. The reason that production has become unsustainable is because of the way most people use essential oils. Many companies promote unsustainable ways of using oils, to boost their sales. We are not advocates of using larger and larger quantities of essential oils. They are the soul of the plant. To want to consume more and more is hauntingly disrespectful and unsustainable. Sacred oils and ancient attars are very powerful energetically. They are the living essence, the soul of the plants, transformed. The plants offer their unique wisdom through their aromas. 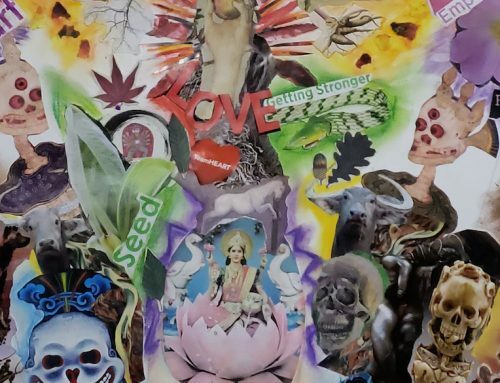 To Florian they are friends and he says ‘I don’t eat my friends.’ With oils that are alive and have viriditas, we feel that only smelling them and anointing ourselves with them is enough to benefit from their intelligence, to learn from them, and to receive their healing wisdom. Through scent and anointing, the oils’ and attars’ healing information goes directly to the limbic brain. There is no need for more than a whiff and or just one drop to anoint. If we want to be sustainable in how we relate to the powerful plant teachers, we need to ask ourselves, do we really need to pour rare and sacred plant extracts like these into a wide range of products? Our mission is to educate people to tune into and communicate with these precious oils as allies, rather than consume them as products. We’ve found that sometimes just holding or carrying a small bottle with a few drops is enough to the oil to be our ally in everyday life. 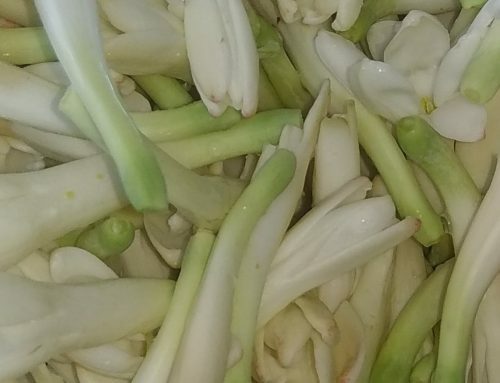 Through our unique way of working with the plants and oils coupled with an ongoing honest dialogue with our carefully chosen suppliers, whom we have personally met and built relationships with we feel confident that we are able to provide pure, authentic, high quality oils and attars. In balance with this, the yin to the yang of the above so to speak, we have GC/MS analyses of our oils, both from Moosa and from an independent French lab. We hope you enjoy this carefully chosen gems from the heart of India and that they become your friends and allies.